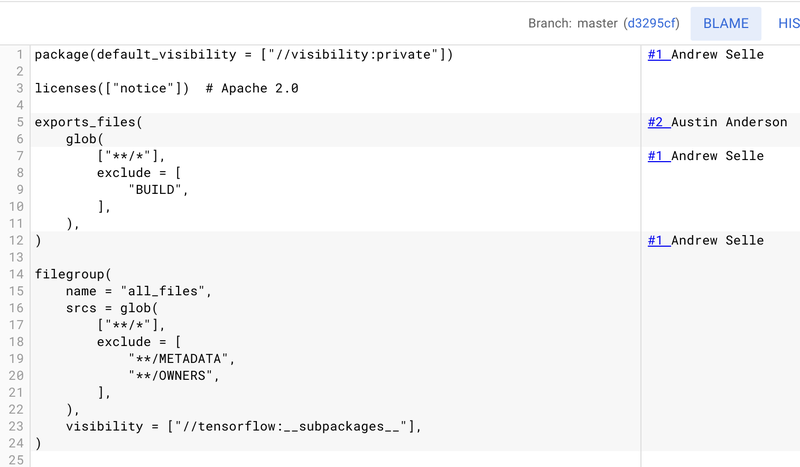 When viewing a file in Google Cloud Source Repositories, use the Blame or History options to learn more about changes to the file view, such as what lines changed and when. The Blame panel displays information about who made what change to a file and when. A username and change number can appear multiple times for a given file. For example, if a user changed multiple lines in a file and submitted those changes in a single commit, each affected line would contain the same username and change number. From the My Source or All Repositories view, select a repository. Browse to the file you want to view and select it. Click BLAME, located in the upper-right corner. You can also learn about how a file changed over time through the History option. This option opens a Change History section, which contains information about each commit that affected the file. You can view the history for a file from the File view or the Blame layer. Click the History link in the upper right corner. The Commit History panel displays a list of commits. Each row displays the hash for that commit as a hyperlink. Open the Change History panel using either the Blame panel or the Change History panel. The Change History panel opens. Hover over that commit's row. A View button displays on the same row as the commit.